Olney Jazz Club Presents Kim Cypher – Saxophonist, Vocalist and Composer! 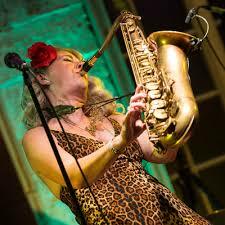 Kim Cypher is one of the UK’s most exciting female saxophonists, vocalists and composers, having developed her own unique ‘funky’ style of saxophone playing, built upon influences by great players such as Gerald Albright, Maceo Parker, Pee Wee Ellis, Andy Sheppard, Dean Fraser, Courtney Pine and Grover Washington. Kim trained alongside American saxophonist Pee Wee Ellis (saxophonist with James Brown and Van Morrison) and internationally acclaimed jazz saxophonist Andy Sheppard. Kim’s vocal style has been influenced by the great Billie Holiday together with a wide range of vocalists including Imelda May, Caro Emerald and Liane Carroll. Inspired by the funkier side of jazz, Kim’s style of performance is best described as ‘funky saxophonist meets 1940′s jazz singer’. Kim performs an eclectic mix of music spanning many genres with a quirky, jazzy twist together with her own original material, all packaged up in a captivating performance and warm stage presence. Kim’s debut album ‘Make Believe’ was released end of 2016, receiving a glowing review from London Jazz News. Following an album launch event at The Queen’s Hotel Cheltenham, Kim and her band are currently performing a series of album tour dates across the UK and overseas including Pizza Express ‘Live’ Dean Street, The Pheasantry Chelsea, The Stables Wavendon, Cheltenham Jazz Festival, Bristol Jazz & Blues Festival, Nantwich Jazz & Blues Festival, Birmingham, Sandwell & Solihull Jazz Festival, Pershore Jazz Festival, Guiting Music Festival, Olney Jazz Club plus jazz clubs, theatres and venues all across the UK. Tour dates in New York are also on the cards for 2019. Music from the album was featured on BBC Radio 2 Clare Teal’s show in August 2017 plus national and regional radio stations across the UK and US. Kim has performed alongside some of the country’s finest jazz musicians including Dave Newton (piano), Clive Morton (double bass), Liane Carroll (piano & vox), Alex Steele (piano), Remi Harris (guitar), Andy Sheppard (saxophone) with regular band personnel including highly acclaimed musicians Lee Jones (guitar), Tom Clarke-Hill (double bass), Rory McInroy (piano), Chris Cobbson (guitar) and husband Mike Cypher (drums). Kim regularly collaborates with US guitarist B.D. Lenz and his band including Easter and Summer tours plus a brand new original track ‘Rising From The Dust’ released in the Autumn of 2018. A new original track ‘Maybe…’ recorded with David Newton, Clive Morton and Mike Cypher was released on 30th April 2018 with exclusive first radio play on The Jazz UK. Kim is an accomplished jazz vocalist and composer, having written many original songs that combine her saxophone playing and singing. She has featured on national TV and Radio and has recorded as a session musician on a variety of recordings as well as running her own bands. Olney Fans, it’s a huge privilege for the club to feature Kim and her Quintet on Tuesday, 2nd April. So best get to the club with time to spare!